A basketball coach once told me “if you want to get good, play against someone far better than you”. This led me to a bruised ego, but much better performance in the long run. I want to do the same exercise right now breaking down a Triple A studio’s gameplay trailer and even if this is far beyond your project’s budget my hope is that you will understand the high level concepts and apply them where you can. 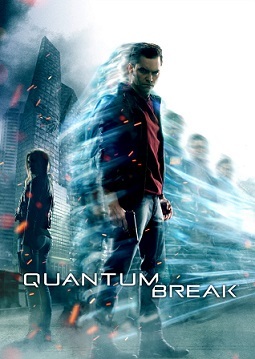 For those who don’t know, Quantum Break is a new IP by Remedy Entertainment in development for the Xbox One. It’s another contestant to the high risk game of trans-media development featuring a live action show to accompany the game. I’ll try to break down as many of the concepts as I can. You will probably notice that for the first three and a half minutes, there are no “gameplay” mechanics shown. Sam, the Creative Director, spends the entire time setting up the story to give players a sense of immersive context. Why? There needs to be an emphasis on the backstory so character development, narrative exploration and plot arc will mean something to the player. In a trans-media property, developing an engaging story to share across your media platforms is a primary goal. – You are creeping and hiding through a derelict building while the streets are ruled by the militia. Seeing someone up against the glass with police lights flashing behind them shows the need to find indirect alternate paths because the traditional routes are not safe. Confirmed by the need to crawl out an old window. – The character reacts out of necessity and not out of expertise. When moving through the building, he doesn’t move confidently but hesitantly. The developers wanted to show this clearly as he holds his hands up to block the light when a bright light pierces a window. – Forced to make use of what you’re given. When entering a new section, the character’s head looks around curiously as if to analyze the new environment he’s in and what he can make use of. Sam really understands what the benefits of his game are. Watch at 5:00 and listen to what Sam says. “When Jack uses time powers, the enemy loses track of him resulting in exciting cat and mouse gameplay”. A most important concept – remember that you are attempting to create a short story encapsulated in this trailer. Plunging a character into action yields apathy and confusion. Spend the time to tell a story which sets the tone for the game. Anytime you want to show a moment of intensity in respect to plot, mechanics or conflict give the player breathing room to process it before exploring something new. During the fight scene you will notice there are a few minutes without any talking. Sam has described the context and built the stage for what players are about to see – so he stops talking so they can watch. Understand that you’re goal is not just to have a viewer watch your trailer but to become engaged with the content. If you find yourself constantly talking you need to back up and decide what are the most important things which must be said and leave out the rest. I urge you to start with your Creative Mandate – what is a one sentence theme or concept you feel defines your game’s strengths? Based on this, come up with 3 – 5 of the ways in which you’re going to demonstrate this to your audience. Call these your “means”. Finally, develop the technical specifics for how you will expose these means. I’ll write an example creative mandate as an example based on Quantum Break. We have our goal defined with several major portions (the means) that we want to carve out. I can think of no better way to showcase this than to give a rich sequence of audio and visual worldbuilding. If you look back at the first 3 minutes of the footage, the content focuses on the character navigating through a eerie and dark warehouse filled with cold and sterile objects. Your player skulking through shadows and flinching at noises aims to mirror the player’s internal psyche. This is an obvious component of the game which needs to be displayed. With your audience being introduced to this mechanic for the first time, ease them into the experience with strong visual and audio queues. Have the player camera pause to first witness the time freeze prompted by the visual and audio functions which accompany it. Let the first few times it happens be like art – something to be viewed. Consider the careful progression one must make when ever teaching someone anything new. In the trailer, the first few seconds of the first combat experience is about first demonstrating the very fact that the character is facing an enemy. Before shooting back, the character has hidden behind multiple objects and moved tactically. The character shoots down his enemies with traditional shooting mechanics before introducing the time warp abilities allowing an augmented experience to the classic 3rd person shooter. By the end of the sequence, chained combat animations allow an informed audience to captivated by visual effects and animations because they understand what they are watching. Call it platforming, action based quick-time, intuitive environmental problem solving or whatever you like – a major feature of the game is applying your time powers to the world around you. Showing unbroken sequences of puzzle solving with increasing visual and audio intensity showcases the player conquering their world. We now have 4 primary means of communicating our creative mandate to the audience. Take time and create a trailer you’re proud of. Show friends and your team before publishing. It’s entirely about quality when showcasing your game. I sincerely hope this helps with your promotional efforts. Very interesting post. I’ll keep it in mind for my next trailer.